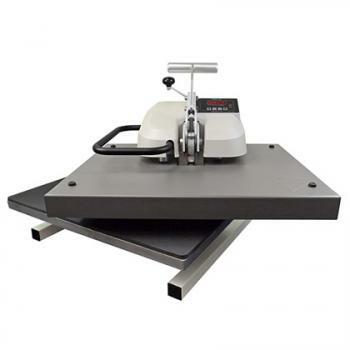 The Insta 288 Swing Away heat press machine is our largest manual machine sporting oversized 20”x25” platens for ease of use with larger items and transfers. It doubles perfectly as a sublimation heat press machine because the size of the platens as well as its capability to consistent temperature and pressure. Both of these characteristics are necessary in sublimation transfers. Some of the best global clothing brands use our Insta 288 because of its versatility in different types of heat transfers. This manual heat press is so reliable that it has the ability to perform around the clock without sacrificing consistent results, precise temperature, and rapid heat recovery. Interchangeable Lower Platens (sold seperatly). Its lower platen can be easily removed with the Quick- Change™ mechanism and replaced with smaller accessory platens for printing on pockets, sleeves, pant legs, back-neck and much more. Interchangeable lower platens provide you with tremendous printing versatility, all in one machine. Cast-In Heating Element - The tubular heating element is cast into the aluminum upper platen, heating the metal from within. The element is coiled throughout the upper platen to provide a reliable and even circulation of heat out to all corners.